This was a chaos draft where we drafted a TOA Team Pack, then a dozen packs from Thor and another dozen packs from Green Arrow and the Flash. I didn’t see a whole lot that excited me as something to build around, but I did keep three or four rares that I had been missing from my collection. Two of them – Mr. Fixit and Cold Gun even went on the team. Heimdall and S.T.A.R. Labs went on the team for ramp. Heimdall proved to be a very poor choice, which will be discussed at more length in the Post-Mortem. I thought I might be able to make use of Goliath Fighter’s ability to build up Experience tokens. The global on UC Wrecker might be able to assist with that. 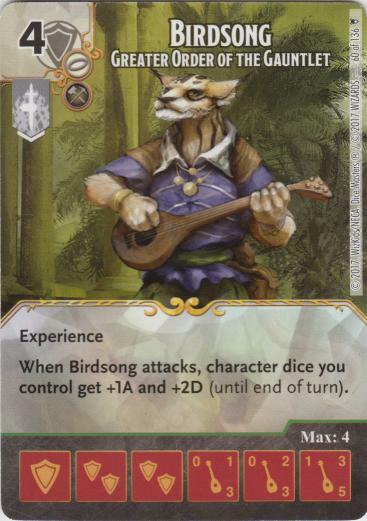 Birdsong’s ability looked like it might be fun. In retrospect, I think I included Poison Dart Trap because I had 4 dice for it. Which was not really a particularly good reason. I got a Goliath Fighter die out fairly and pinged out two of his sidekicks on the same turn to get an Experience token on the Goliath Fighter card. That was the only Experience token he got all game, but it proved vital. I bought mostly Goliath Fighter and Heavy Armor dice. The first Heavy Armor die I rolled landed on the double burst face. If I attached that double burst Heavy Armor die to a Goliath Fighter die, anything Goliath Fighter blocked lost Overcrush. 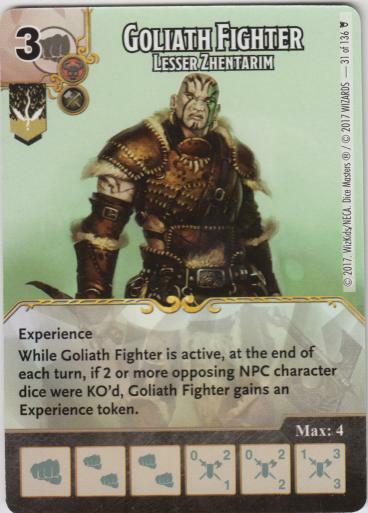 And if that Goliath Fighter is Level 3, it has 7 Defense (including the +1/+1 from the Experience token). He got a Grodd die out in the early part of the game, but struggled to afford anything else expensive (as did I). Part of it, in his case, was it looked like he was being very careful not to let me do the ping 2 of his Sidekicks with Magic Missile to get Goliath Fighter an Experience token. Which meant those Sidekick dice (Max 1 Energy) kept circulating through his bag. We eventually went to time. At out store, that means when the time call comes and it’s the middle of Player A’s turn, Player A finishes his turn, Player B takes his (final) turn and the game ends. Whoever has the most life is declared the winner. Time was called on my opponent’s turn. He had 17 life to my 8 and attacked with everything. I was able to block and KO everything he attacked with, then swing through his empty field for the 10 damage I needed on my final turn. This was a long game, but a really interesting one. That one Experience token I got on to Goliath Fighter made a huge difference. Common Ragnarok, Rare Grodd, Common Kobold Trap, and Zombies. He had half a dozen Kobold Traps (this was considered a double Rainbow draft, so dice limits on cards didn’t apply), and I almost certainly lost this game when I messed up and fielded a Level 2 Goliath Fighter, forgetting it would trigger 3 Kobold Traps. That took 3 of his Zombie dice straight from the card to his Field Zone. I decided my best bet was a double Birdsong rush. On what proved to be my last turn I rolled 4 Sidekick dice and 1 Birdsong die. On the initial roll, the Birdsong came up Level 3, and the Sidekicks came up 1 energy and 3 Sidekick/Pawn faces. I used the Cold Gun dice I had active to KO two of his Zombies, then attacked with everything. I didn’t count the damage beforehand, not out of carelessness, but because I thought that if I didn’t have the ability to win the game at that point, I was ultimately going to lose the game anyhow. I got him down to 3 life, but he survived since he had an active Guardian of Faith die that was able to ‘block’ a Sidekick. (I was attacking with two Birdsong dice, so my Sidekicks were 3/5). Common Hulk, his own copy of Burning Hands, and a variety of cheap characters. The cheap characters allowed him to build up his wall faster than I could build up mine. Then he started buying Hulk and Burning Hands dice and did enough burn damage that he could finish me off with a mass assault. This was a polyglot of a team, and not particularly well thought out. I do like Goliath Fighter, but it proved more difficult to get Experience tokens on him than I had expected. Having my cheapest character be a 3-cost was a mistake. I needed something cheaper. And the above mistake aggravated the mistake of including Heimdall, thinking he’d be useful for ramp. Not on a thin bag team, he’s not. 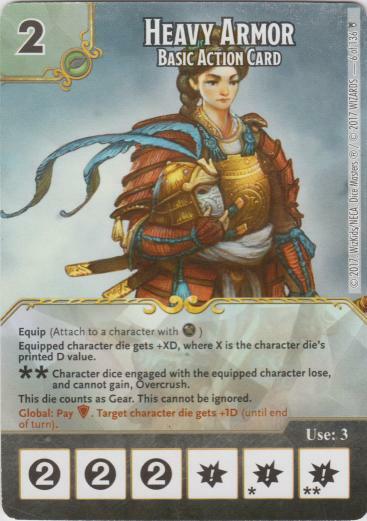 You need Sidekick dice in your Used Pile on your turn to use him, and since I had little in the way of cheap dice to purchase, I’d find myself using Heimdall on Turn 2 and then never seeing the opportunity to use him for the rest of the game. On my Roll and Re-roll steps, I’d pull out two or three dice from my bag, refill it, then draw more dice to get up to four. Then I’d end up with two or three dice in my bag at the end of that turn. I was in a nearly endless loop of refilling my bag during each Clear and Draw Step, so there were never any Sidekick dice in my Used Pile for the Heimdall global to target. Thanks for reading, and Happy Rolling!